This sweet little baby girl is ready for her bath, complete with a unicorn themed towel and a little unicorn bath toy. What's not to love about this cute baby princess doll by La Newborn? She's designed to have a playful, peek-a-boo expression, and her soft, colorful towel adds a whole new layer of realism and enjoyment. 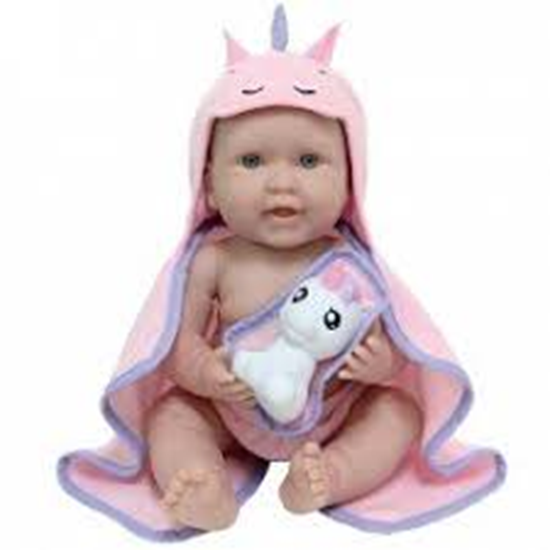 Your child will love bathing this sweet little doll and can immediately swaddle her up in her beautiful unicorn-themed towel. There's even a hood on the towel, so baby's head will stay nice and warm. She also comes with a unicorn bath toy. Dolls by Berenguer are well known for their superior quality as many of these dolls are made in Spain. For over 50 years Berenguer has designed dolls that have set the standard in the industry. All dolls by Berenguer are hand sculpted and design to bring joy to collectors.